I arrived in Bangladesh’s capital Dhaka last week via the Emirates Airlines. The flight from Newark to Dubai was delayed by an hour and the in-flight service crew were poorly prepared to do their task satisfactorily. Upon arrival in Dhaka airport, I waited for another hour and a half before I could collect all my baggage. One of the bags missed a lock; the TSA (Transportation Security Administration) agents had removed the lock in Newark airport to check the bag. Nothing fortunately was missing from the bag. Since the death of my mother some three years ago, I have been visiting Bangladesh more frequently. This latest visit is planned for a long stay, almost three months so that I could spend some quality time with my father. It has become quite difficult for very senior citizens like him to be cared well, esp. when their children are settled overseas. I, for one, find myself guilty of the decision I took decades ago to settle in the USA where I had gone to complete my graduate studies. With hard-earned graduate degrees from prestigious universities came job offers that were difficult to ignore; and then with kids born and raised in the USA, the urge to return to my native country weakened for my wife and me. 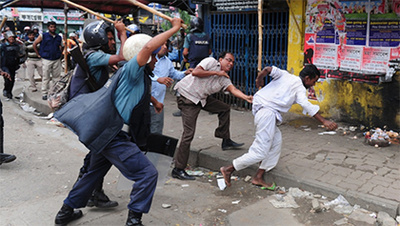 The political unrest and deteriorating law and order situation inside Bangladesh have not been favorable either to return permanently. But still I dream that situation would one day become better allowing people like me to return and contribute more effectively. It’s a wet or rainy season this time of the year in Bangladesh. Since arriving in the port city of Chittagong where my father lives, I have not stepped out of our home. It has been almost four days, and yet this time, the jet-lag has really taken toll upon me messing up my sleeping pattern. Upon suggestion of my old friends from BUET, I took a train ride from Uttara Airport station to go to Chittagong. It was a wise decision. As expected, the train came on time and arrived on time, taking less than five hours. [By the way, of all the government sectors, the rail system has been working satisfactorily for years.] One of my nephews – Salman – came to receive me at the station. It was a short commute from the train station to my father’s residence in Khulshi. My younger sister, Jessy, who has been living next door, was absent this time to receive me. She had accompanied her husband for the latter’s treatment in Chennai, India. Despite the mushrooming of hospitals and health clinics, most Bangladeshi patients don’t have a positive perception about the local doctors and/or the health care system. Thus, those who could afford the extra expenses would rather have their treatments done outside than inside Bangladesh. Even for a minor health checkup they would go to places like Singapore, Thailand and India. It is no accident that many of the health clinics and hospitals inside India are functioning rather profitably because of such a large client/patient pool based in neighboring Bangladesh; without these patients these facilities may had to be shut down. I am, however, told that getting the Indian Visa for medical treatment is not an easy one, and could be very frustrating for the patients requiring urgent care. My brother-in-law had to wait for nearly three weeks before he was issued such a visa. Most patients would return to see the same doctors, which says a lot about the positive impression that these Indian doctors have been able to imprint in the minds of these patients and their loved ones. Thus, there is always such a big queue for visa applicants to India in Dhaka’s Indian Embassy. Bangladesh will have its parliamentary election at the end of the year. Candidates are, thus, very busy these days selling their credentials and images to the voters. One respectable leader was cited in Sunday’s newspapers claiming that 97% of the elected MPs are corrupt. I am told that the actual figure is higher! Betrayed repeatedly by immoral, corrupt, greedy and selfish politicians, the Bangladeshi voters have gotten accustomed to their plundering and robbery, and false promises. They still cast their votes hoping for a better future, which seems increasingly elusive these days! In her speech to the party cadre last Saturday on the 69th anniversary of the ruling Awami League, the party Chairman and Prime Minister Sheikh Hasina implored them to earn the trust of the ordinary people through honesty and hard work. Sadly, honesty is becoming relative, if not an obsolete term in Bangladesh. While it still exists amongst mostly a non-tested segment (and amongst a smaller fraction of the tested segment) within the populace, finding an honest government officer wielding some power may be quite difficult. This explains partly why the country of some 160 million has such a poor perception index from the Transparency International. In 2017 it ranked 143 – far worse than any of the south-Asian countries with India (ranked 81), Sri Lanka (91) and Pakistan (117). According to the latest published reports, there are some 3.4 million judicial cases pending in Bangladesh. And thanks to an utterly corrupt system, this number is growing alarmingly every day. Compounding this problem is the presence of only 1700 judges throughout the country: meaning, on the average, every judge will have to review and judge nearly 2000 cases! If no new cases are to be added, such may take years for a hearing! Imagine the trauma faced by the family when the police knocked on its door at around 10 p.m. in the month of Ramadan when people pray the Tarawih prayer! Within half an hour, they had to face – not one but two - groups of police forces bringing such warrants; and it did not matter that the accused ones were decades older than the cited ages within those warrants! This real case says a lot about Bangladesh and its failing judicial system, and why those who have seen better don’t want to return to their native country! In a society where law and order prevails, such a matter would have been rare and guilty parties promptly punished; the attorney general’s office or the public prosecutor’s office would find the plaintiff guilty of deliberately falsifying the court and creating disorder, and the corrupt magistrates fined and put behind the bar for their dereliction of duty and misuse or abuse of the public trust. But such irregularities are norms in today’s Bangladesh where the criminals have long arms and deep pockets to terrorize and harass law-abiding ordinary citizens of the country who have no one to come to their aid to relieve their pains and sufferings. Either they fight their own cases in a system where they and their grandchildren may never see the ultimate end of their cases or simply forget their sufferings and try to move on. In this country, government has failed them and continues to do so, despite all the promises made by the ruling party and its chairman. I often wonder: does anyone truly cares for the common people! If the above harassment could happen affecting some of the most law-abiding, tax-paying citizens who are well-educated and -connected, and socially known for their philanthropy, truthfulness and uprightness what chance does an ordinary Salimullah and Kalimullah have to survive in Bangladesh? Even the ministers and high-ranking government officers are keenly aware of the caustic effect of systemic corruption that they have either created or failed to stop. It is not by accident that almost all the ministers and high-ranking government officials have their own family members living outside the country! Many of these individuals have second or third homes in places like the UK, USA, Australia, Dubai and Malaysia.